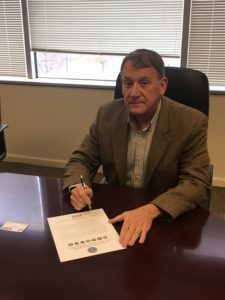 JBM Signs Department of Defense Statement | JB Management, Inc.
January 17, 2018: Andy Vonada signs Department of Defense Statement of Support of the Guard and Reserve. JBM is proud to include members of the National Guard and Reserve, past and present, within its ranks. The statement signifies JBM’s continued support in 2018.